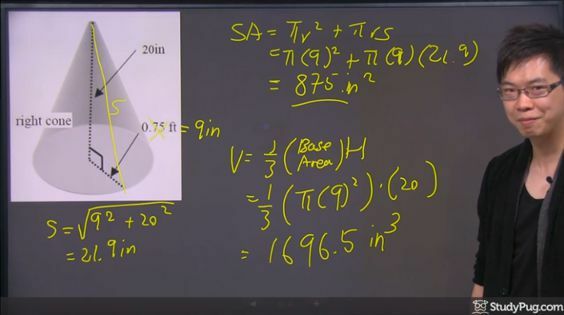 Before we deal with calculations for the surface area and volume of cones, let&apos;s understand what a cone is first. 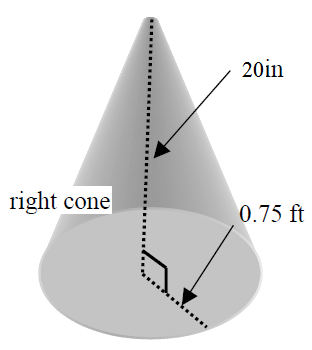 A cone is one of many geometric shapes. 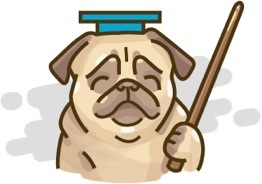 It has a flat surface on one of its ends and it comes to a point on the other end. The cones that we will be discussing in this section are right circular cones. What exactly is that? It&apos;s a cone that has a circle on its flat end, and a point that is 90 degrees from the center of the circle. As we will be dealing a circle, be prepared to use pi and radius in our calculations. Take a moment to review this if you need before proceeding. How would this work in a math problem? 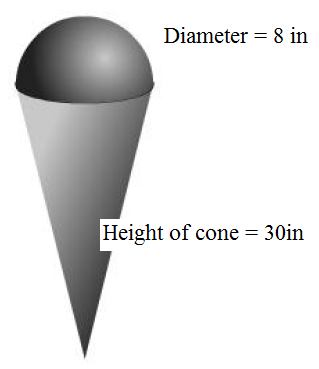 Find the surface area of the following cone. Let&apos;s try it out on an example. It&apos;s the same cone as the previous walkthrough, so you should be quite familiar with it already. In this example, we didn&apos;t have to find an unknown for the volume, but there may be times where you&apos;ll be required to do so, such as when the slant is given, but we don&apos;t know the height. Always work on finding the unknowns you&apos;ll need for the different formulas first, whether it&apos;s for the volume or surface area of a cone. You can take a look at more examples that illustrate a cone and its volume and surface area with this online click and drag cone resizer. This cone calculator can also help you double check your calculations. We just learned how to calculate the surface area and volume of pyramids and cylinders in the previous lessons. Now, we will look at cones - objects that have circle bases like cylinders and pointy tops like pyramids. 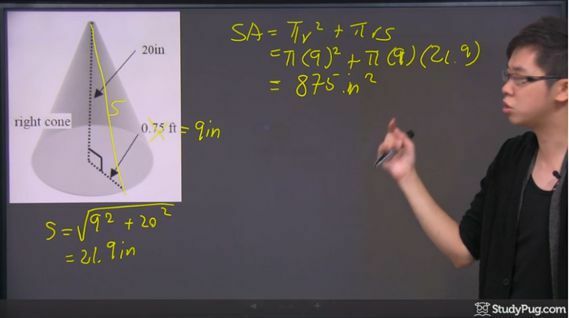 Just like pyramids and cylinders, there are formulas for surface area and volume of cones. We will also try out some questions on composite solids that consist of cones too.